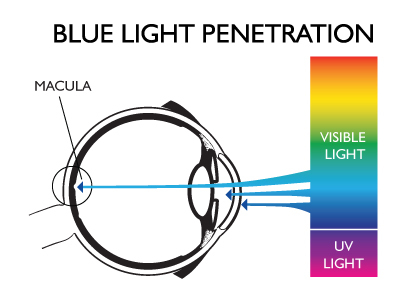 You have probably noticed that we’ve placed a lot of effort on explaining the damaging effects of artificial blue light, and about how our lenses block the ideal amount to protect your eyes. Our lens tint is scientifically formulated to provide your eyes and body with a natural light experience, and protect your eyes from digital eye strain. Over the years, we’ve also been working with professional athletic trainers and the players they keep conditioned. And while this revelation isn’t exactly exciting at face value, what impacted us was how important a good night’s sleep is for these million dollar machines and the trainers who are charged with keeping them in tip-top shape. We felt the growing concern about getting quality sleep would be a great opportunity for us to segue the conversation to the science behind how GUNNAR glasses can help. Yes, we understand that some of you may be skeptical, and we prepared this article with you in mind. So, let’s go step-by-step into what’s going on in physiological terms. A) Understanding the basics. Blue light is everywhere. In its natural form, your body uses blue light from the sun to regulate your natural sleep and wake cycles which is known as your circadian rhythm. Blue light also helps increase alertness, improves reaction times, boosts your mood, and increases the feeling of wellbeing. Visible light is a form of electromagnetic radiation that carries energy. The shorter the wavelength, the stronger the energy. 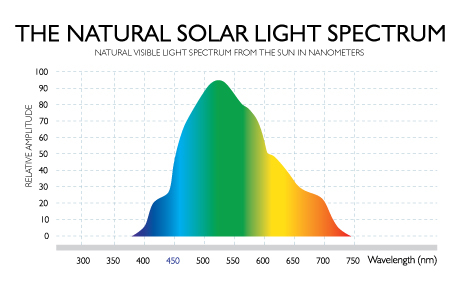 Because blue light has the shortest wavelength in the visible light spectrum, it carries the highest amount of energy. Over exposure to blue light can cause both short-term and long-term damage to your eyes. 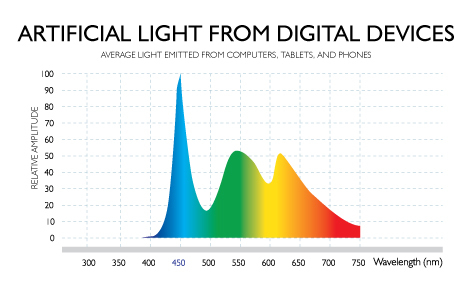 Because blue light wavelengths are shorter, they flicker more than longer, weaker wavelengths. This kind of flickering creates a glare that can reduce visual contrast, and affect sharpness and clarity. This flickering and glaring may be one of the reasons for eye strain, headaches, and physical and mental fatigue caused by many hours sitting in front of a computer screen or other electronic device. Which is what many of us and professional athletes are doing at night. Our eyes have natural filters that do not provide sufficient protection against blue light rays from the sun, let alone the more intense blue light emanating from digital devices. Prolonged exposure to blue light may cause retinal damage and contribute to age-related macular degeneration, which can lead to loss of vision. Furthermore, blue light is what triggers your brain to stop producing melatonin, the chemical your body creates to help you get deep, restorative sleep. How this all works is when blue light hits your retina (the only wavelength to pass through your cornea), an enzyme in your eye sends a message to your brain to stop producing melatonin. If we lived in the Stone Age, all of this would take place naturally and GUNNAR wouldn’t need to exist. But we’re in the Digital Age now, and over 80% of us are using an electronic device an hour before we head to bed. You might be thinking, big whoop! I do just fine – I can stare at a screen all day and still get good enough sleep. Except that’s not the case for most people. Sleeping and deep restorative sleep are very different things. Restorative sleep allows your body to repair and heal during the night. Even more important to take note of is how bad over saturation of artificial blue light is for you, your eyes, and your brain. 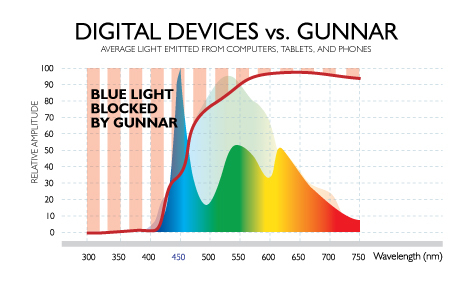 When coming from a digital device, blue light is 65% more intense than the atmospherically reduced blue light naturally seen from the sun. And while a rare few individuals may not necessarily feel the adverse effects, there is still a chemical reaction taking place that cannot be avoided. Therefore, when it comes to professional athletes, their trainers are seeing the effects in their poor performance the next day at practice. B) Blue light can reduce the quality of sleep you get at night. Medical professionals from the Psychiatric Hospital of the University of Basel and Cyclotron Research Center, University of Liège, proved that evening exposure to blue light significantly impacted sleep quality. Remember, all electronic devices emit artificial blue light at a much higher intensity than what we see from the sun, so this means any use of any device prior to bed can reduce the quality of sleep you get. C) Blocking blue light will help you sleep better and increases melatonin. Experts from Keio University School of Medicine and Tokyo Medical and Dental University in Japan investigated how much melatonin and sleep quality were affected when something was used to block artificial blue light prior to going to bed. What’d they find out? Measurements and study results showed that the 12 adults who participated had more melatonin, and better sleep efficacy and latency when they used a “blue-light shield”. D) Amber lenses that block blue light will improve sleep. Professors from the University of Toledo did a random study on 20 adults who were broken up into two groups. One group wore amber lensed glasses blocking blue light, the other wore yellow lensed glasses only blocking ultraviolet light. At the end of their study, they found that the group that wore amber lensed glasses not only experienced significant improvements in how they slept, but also in their mood. E) Why should I want quality sleep? The U.S. Department of Health & Human Services National Heart, Lung, and Blood Institute recognizes that sleep is vitally important to your health and wellbeing. Sleep deprived individuals suffer from a multitude of medical issues. But those who get quality sleep have healthier hearts, better hormonal balance, and a stronger immune system among just a few of the benefits. Ultimately, though, it’s about performance and functioning at your best each day. 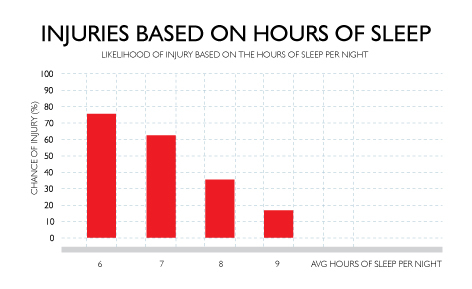 Without the right amount of sleep, your body will not repair and you will suffer. Given all of this information and these studies, it goes without saying that GUNNAR eyewear, among other benefits, can indeed help you sleep better. Note that our patented technology is specifically designed to block from 100% to 65% of artificial blue light across the 380-450 nanometer wavelengths which is the range of blue light that is damaging to your retina. No other lens or eyewear company can compare. None. But don’t just take our word for it, see for yourself by watching our laser test. The bottom line is we offer a solution to a problem that could otherwise be avoided if everyone turned off their digital devices. That’s not happening anytime soon, though, so you’re better off taking the necessary precautions in order to improve your work, your play, and your sleep. You may not be a professional athlete, but you are competing in life every single day for maximum efficiency and effect. Staying at the top of your game is crucial to your personal success, and we are here to help. 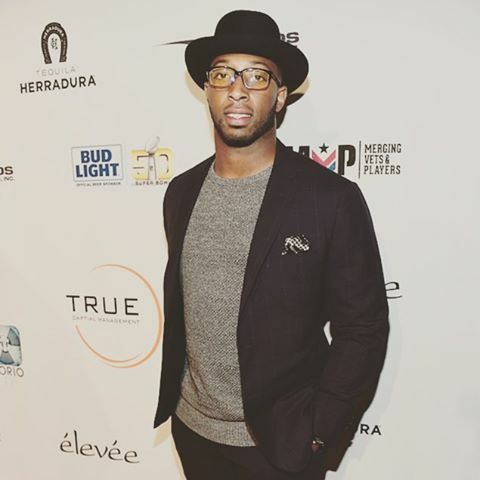 NFL running back Stepfán Taylor wearing Haus. Photo courtesy of Stepfán Taylor. Now’s a great time to join the GUNNAR Movement by checking out our latest styles, FPS designed by Razer and Vertex, which are both in stock today.